Three months and no newsletters! You must be champing at the bit (ummm!). Horrific earthquake and tsunami in Japan. How they suffered and then the consequences of the nuclear reactors. But how stoic they are, repairing roads so quickly and life just getting back to normal. Then there’s the mad colonel in Libya massacring his very own people, and the same in Syria. OK, let’s send a few million pounds worth of hardware down his throat. Unfortunately he’s just one of those survivors. Talking of which; what fantastic news about OBL (One B….rd Less) being scattered amongst the fishes. A pity they didn’t drop him out of an aircraft over the Atlantic and see what it’s like dropping from a height like a number of his victims had to on 9/11. Certainly some embarrassed faces though in Pakistan and many questions unanswered. We all know there are a number of people high up in the echelons of power sheltering his cause, yet we still pour billions into their coffers. Recently some excellent news with Mladic being nabbed after so long on the run; again being sheltered by those extreme orthodox nutters. Another monster taken down. Slight embarrassment in the IMF – DSK. Sure, innocent until proven guilty, but hasn’t he “been there before”? What about some good news for once. A brilliant royal wedding putting aside all those “moaners and groaners” who thought it not right to be having such a celebration in these difficult times. It’s called “boosting morale”; we need something happy now and again and not all doom and gloom. 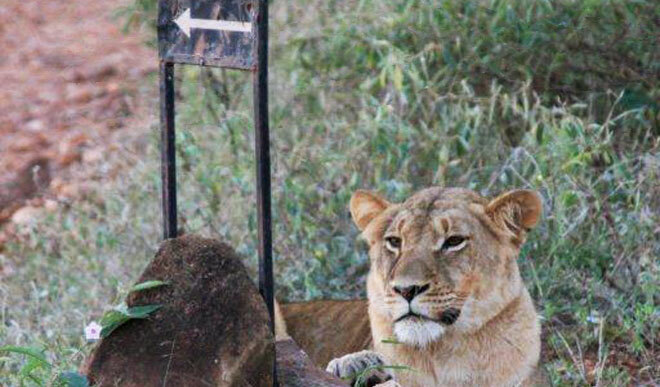 Well, at least they came to “Africa” for their honeymoon. What a fantastic couple they look. However… some of those “hats”. The Queen in Ireland – that is really something. How she keeps going and also how she is so unassuming, but grand at the same time. She was magnificent and long may it continue. So HMQ goes, and so BO has to go as well! Finding his roots!! It seems everybody wants to come from Ireland. Great sports with a fantastic Cricket World Cup. I thought the semi-final between Sri Lanka and Pakistan was the best game and the most entertaining. Then the sub-continent winning it; even better – they thoroughly deserved it. Twitter and Ryan Giggs (how funny! ); although Sir Alex doesn’t see the funny side it would appear. What a ridiculous situation with Injunctions etc – Ha! The sad sad news about Seve. An impeccable sportsmen and a huge loss for “sport” in general. Yes, more coming! Local elections here in SA and UK. The alternative vote in UK not getting anywhere, and Labour not doing well at all. Keep it going DC (Nick – just move on and out). Here in SA the ANC were given a “warning shot”. The DA held on to the Cape as expected – The only province in SA which has passed their audit. Down here we closed down for most of March for our annual clean up. The guides have done magnificently finding the game with some spectacular sightings. One of the best being a lioness and leopard scrapping over a kill. Then a lioness chasing the 2 male cheetah away. Numerous lion sightings now as the big males have established their territory firmly on Garonga; almost every evening and morning you can hear them calling. This has also resulted in Cubs (3 of them). 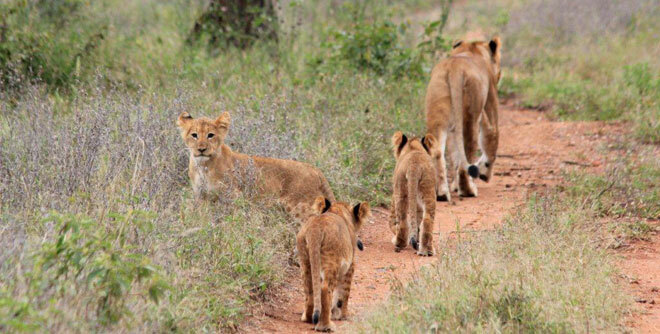 A great sighting of them walking down the airstrip following mum. Walks are proving ever more popular now that winter is setting in. Sleep outs carrying on regular as ever. In April it was a pleasure to welcome back Mike and Sue, Andrew and Charlotte, Philip and Gerti with the 7th Cavalry, and finally Bea and Olivia. Also a warm welcome to Carolyn from New Frontiers and Sally from Sally and Alice Travel. In May we had the big event of Peter and Tina’s wedding with 16 other family and friends taking out both Camps for 5 nights. The wedding itself was held at Fig Tree Pools on the Makhutsi River; a truly spectacular venue should anybody wish to try it. They had choir and dancers performing; so all in all a really spectacular day. Well done to all the staff for making it so special. Kehnsani (chef) had a huge smile on her face as she was chosen to be a witness with CJ. A warm welcome back to Yolanda, Roland and Hella, Martyn and Carolyn, and last but by no means least Juliette and Magali for 18 nights. Thank you both for the video footage which we will place on our “You Tube” (I know, we are really getting “with it”!). Facebook next! Well we are now in winter mode with no more lunches, but replaced with a high tea. This is due to the game drives returning at about 1015 hrs for a late breakfast. The chefs have produced some amazing cakes, and delicious baguettes etc. Debby has come twice now to spruce up the chefs and their food and so her training has really been a winner with the Chefettes. Look out for next recipe. For dinners, as it is getting colder, coal braziers are going out, and a lot of hugging of the fireplace. On that note, I do try and alternate dinners by some being private, boma, or round table dinners with a variation of plated dinners, curry, and carvery. I don’t get it right all of the time, and so please do specify if you want private dinners. What else? May is the month for the main Africa Travel Show held in Durban. Before attending that Classic Safari Camps of Africa has their AGM, where all owners get a chance to see each other again (normally only around this time when all together). 3 days AGM held at Robin Pope Safaris in the Luangwa valley in Zambia. What a beautiful setting and of course raucous great fun. Serious stuff also done – HONEST! The trade show – much the same, but always worth going to meeting your supporters from the trade and also some new openings. Also great fun to be at the sea! The rest of the year is looking pretty quiet at the moment, and so in order to try and reverse that am offering an “early bird special” – “book before the end of July and if staying 4 nights then you only pay for 3 nights at both camps”. This is valid until 20th December 11. We still offer a “stay 5 pay 4” throughout the year. Check it out with your favourite tour operator! Nope, I didn’t have to say that!